Takayama is a good place to enjoy Japan’s famous cherry blossoms. They bloom a bit later here than in Kyoto or Tokyo, so it’s good if you arrive late in Japan. Here is information on timing and a list of the best spots. In a hurry? Scroll down to our list of Takayama’s best cherry blossom spots. 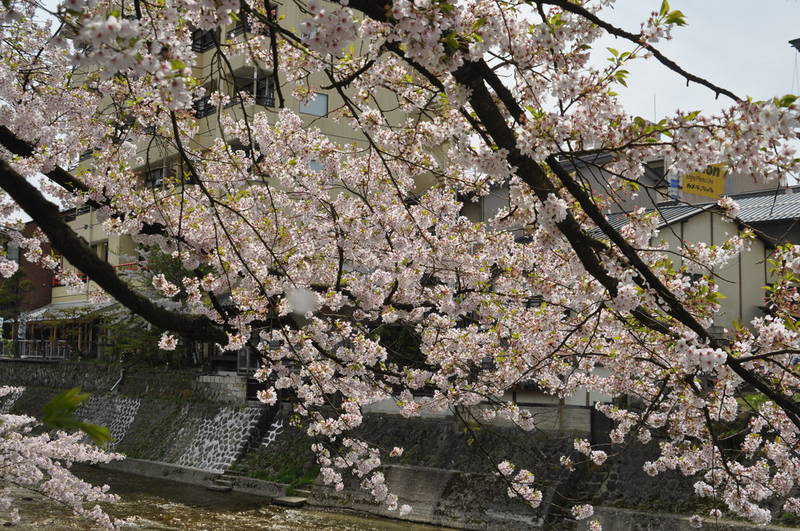 For information on the timing of cherry blossom season in Takayama, read the following section first. When Is Cherry Blossom Season In Takayama? In Takayama, the cherry blossoms (sakura) usually bloom in the last week of March and the first two weeks of April (roughly between 25 March and 14 April). In an average year, the blooms peak on 10 April in Takayama. Once they bloom, they are notoriously fickle: sometimes almost all the trees will come into full bloom (mankai) at the same time and stay in full bloom for a week or even longer. Here is our list of the best cherry blossom spots in Takayama. For more details on these places, visit our Things To Do in Takayama page. Miya-gawa Riverbank: The main river, which runs right through the heart of city, is lined with several beautiful cherry trees. Check them out from any of the bridges that cross the river. Enaka-gawa Riverbank: The more easterly of the city’s two rivers (actually, it looks more like a canal), is lined with lovely cherry trees. It’s very near the Higashiyama Walkway. Shiroyama-koen Park: This hilltop park, a short walk south of the Sanmachi-suji District, is a great place to enjoy the cherry blossoms and maybe even have an impromptu hanami (cherry blossom viewing) party.